Family Gatherings: Fun for Everyone? When families gather together for a celebration, each participant brings their own history, behavior and expectations. When these different expectations and behaviors clash, the celebrations are often far from the peaceful, loving gatherings depicted in TV holiday commercials! However, when common problems can be anticipated and planned for ahead of time, there is a greater likelihood of a joyful celebration rather than a stressful experience. To make these events positive and fun for everyone, it's helpful to consider the areas that cause stress for many families: preparing and hosting the gathering and monitoring the interactions between children from different families. One mom wrote seeking ideas for changing her family gatherings. "I come from a largish family (5 children) who still live in the general area. We're all in our fifties now, married with our own children aged 13 to 25. We still get together at one of our houses for every holiday, four times a year (usually numbering 18-23 people). I have to admit, I absolutely dread these get-togethers. For one thing, my sister, aged mother and I do most of the work. The three brothers do less, and the sisters-in-law and nieces and nephews do nothing. As we get older, it gets more and more exhausting, and it seems like I hardly see my siblings other than these get-togethers, where I'm usually irritated and too busy to really talk much to anyone. Is it unusual to get together this often at our ages? Shouldn't the nieces and nephews be contributing by the time they're out of college?" Assign tasks like cleaning, decorating, watching toddlers, setting the table, serving drinks, clearing the table and washing the dishes. The idea that everyone has to help out may be revolutionary for some so expect a little grumbling the first couple years! Even young children can help by coloring decorations or place cards for the table. By getting kids started early on helping out, you will be preparing them to take on more challenging tasks when they're older. Ask people to bring something to share. Depending on their age and cooking skills, they may want to contribute a homemade pie or pick up bread and cheese at the grocery store. Teens are capable of helping to prepare the food. By encouraging their participation, you will be passing on some important cooking skills while also helping them feel like significant contributors. What options do the children for their free time? An outdoor activity can be a welcome break - a walk to the park, building a snowman or playing basketball. Bringing a new group game like Cranium to the gathering can also provide a fun activity. Where can children get some downtime? If your children are likely to benefit from some quiet time away from the crowd, plan a way to make that happen. Some families rotate where the gathering is held to distribute the work load. Others choose to meet at a neutral place like a park, hotel, restaurant or community room. If you decide to make suggestions for changing your family gathering, it is best to have the person whose family is getting together talk to everyone about the new plan. Typically new plans go over better this way than when introduced by an in-law. You may need to negotiate some of the proposed changes but at least you'll be taking a step in the right direction! Another area that can be rich with parenting challenges is the interaction between the children. For example, younger children may want to play with their older cousins, while the older cousins want to be left alone. Successfully handling these types of disagreements while not offending any of the other parents is no small feat! Being able to enjoy a glass of wine while your children play nicely together and work out their differences by themselves is ideal. However, if unsupervised play doesn't work well, parents need to take a more active role. You can try suggesting an activity everyone can participate in playing like charades or creating a play that can be performed for the rest of the family. We've had some very entertaining family theater this way! Planning ahead is essential. If your children are younger than the rest, take along toys, books or other things that they enjoy. When they're not having fun playing with their cousins, they can play with these toys. Be prepared to leave early if your children are "maxed out" and need to get to their own beds for everyone's sanity! When preparing for your next family gathering, work on making changes that will make the event more pleasurable. 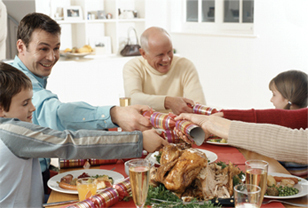 Establishing family gatherings that are enjoyable for everyone will pay off over many years!